Heavy tank – 60 built 1949-51. By 1935, there was an overflow of projects regarding an increase in anti-tank capabilies. Some specs asked for a tank hunter self-propelled gun (SPG), which led to the SAU-40 and ARL-40 design proposals. The first was a Somua project, closely based on the S-35. The second was the ARL V39, built at the “Atelier de Rueil” near Paris. It was basically a modified Char B1 hull with a high velocity 75mm APX gun derived from a 1929 fortress gun, with a Muzzle velocity ranging from 400 m/s (HE rounds) to 570 m/s (AP rounds), with stereoscopic rangefinders allowing a 2000 m practical range, a semi-automatic breech and autoloader, and a data recorder. 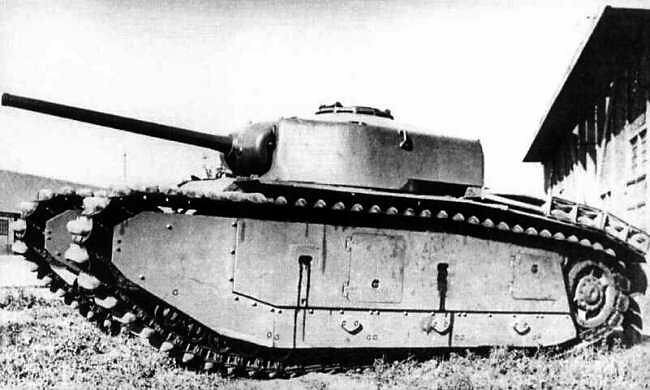 By 1940 a single ARL-40 prototype had been built. No production was ever started even though it had won the contest over the SAU-40. 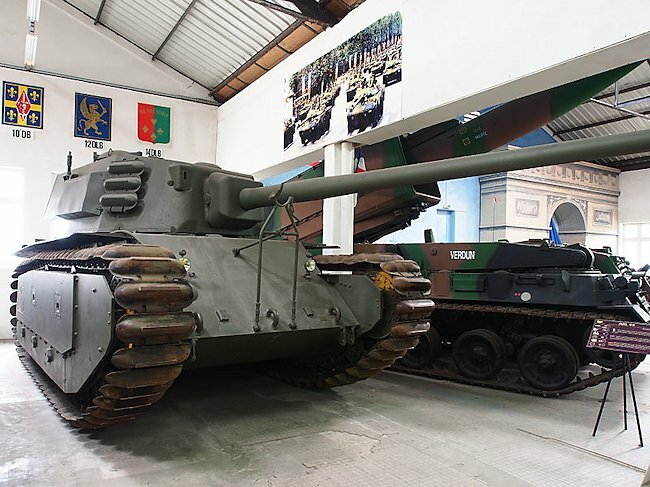 With the 1940 defeat of France, the ARL-40 prototype was evacuated to French Morocco, but the project was stopped due to the absence of an industrial basis for any construction. 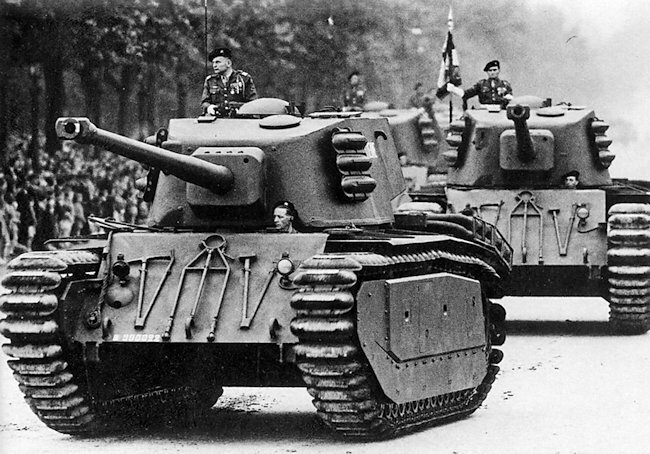 The design of the ARL-44 tank was born during the years of German occupation, through clandestine schemes and the work of a Vichy France secret organization, the CDM (Camouflage du Matériel). The goal was to prepare the future production of a 30-ton tank armed with a high-velocity 75 mm, possibly the APX model previously used on the ARL-40. In November 1943 the German army occupied the free zone and these projects were temporarily halted. Later during the occupation, the Germans asked engineers at the French tank producing firms Hotchkiss and Somua to build a tracked vehicle that could remove snow from Luftwaffe airfields and Kriegsmarine ports. Under the pretense of building this vehicle, the engineers worked on a new tank design for use after the war. This would later become the ARL-44. By August 1944 with the liberation of Paris, the provisional government led by De Gaulle decided to re-establish France as a great power, combined with the goal of participating more massively to the allied effort. One of these contributions was to provide the French army with a new tank able to deal with the latest German models. However, due to the outdated material and lack of resources, a compromise had to be taken. 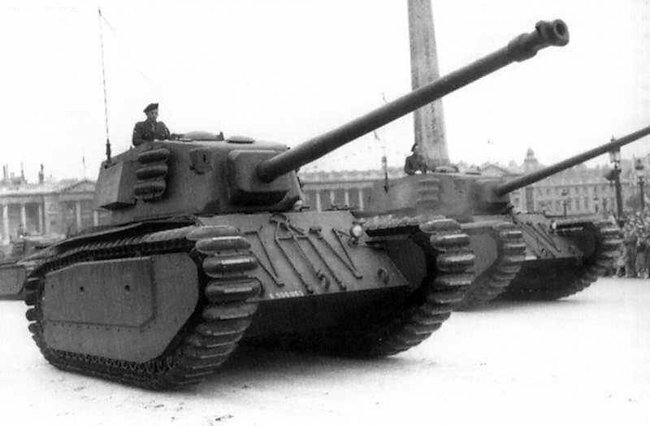 Nevertheless, 600 heavy tanks were planned, with the design done by the DEFA (Direction des Études et Fabrications d’Armement) concentrating former APX and AMX engineering teams, to be built by ARL as soon as possible. This was the start of the ARL-44 project. The thought of building a modern tank with available post-war resources was daunting. A shortcut had to be found. German Maybach engines and 75 mm guns could be sourced in German army supply depots inside France. There were a number of captured or wrecked German Panther and Tiger tanks that could be used to obtain parts. To produce a tank quickly French engineers chose to stick with existing well-known prewar designs like the Char B1, Char G1 and FCM F1 super-heavy tank. For the prototype, French engineer Lafargue converted a 75mm CA 32 gun into the 75mm Long 44 model, with enough muzzle velocity to defeat an 80mm sloped steel plate at 1000m. Plans for the front hull protection was only sloped 60 mm armor plate. As designed the hull was still relatively narrow, with a 90° angle nose beak, an inclined rear engine deck, and a back plate with an inverted slope of around 30°. The prototype’s drivetrain was to comprise of an old-fashion but well-proven system made of 17 small metal roadwheels and three return rollers per side. The drive sprocket was at the rear and idler at the front. There was an additional armor plating on the massive side skirt protecting the suspensions, although compromised by two access hatches. The envisioned engine was to be either a 400 hp Panhard or 450 hp Talbot. By February 1945, the Free French Army high command decided the plans as presented were no better than the 76mm Sherman, already available in large quantities or the captured German Panther and Tiger tanks already in use with some French Army tank units. The engineers were told to rethink their design. The armor was doubled to 120 mm and total weight rose from 43 to 48 tons. The initial ACL-1 turret was made by Atelier et Chantiers de la Loire and mounted an American 76 mm gun. At V-day in Europe, Engineer General Maurice Lavirotte presented a mockup of the final vehicle. Due to the lack of tactical needs, the project was suspended briefly but it was decided to resume nevertheless the production of 60 vehicle to bolster French National morale and prestige. In March 1946 the prototype started a program of test. A new Schneider turret based on the FCM F1 project was fitted to the hull. It was armed with an adapted 90 mm DCA naval AA-gun (muzzle velocity of 1000 m/s to 1130 m/s) featuring a muzzle brake. The turrets were made of welded sides, with a cast front and mantlet, 120 mm thick. It was quite heavy and traverse power was procured by a Simca 5 automobile engine. The definitive production vehicle trials began on 27 June 1947. Turret development and production took time due to the change of the main gun caliber. The 60 tanks were ultimately delivered in 1949 onwards. FAHM provided 40 hulls and Renault manufactured 20 hulls. They were all powered by captured German Maybach HL230 gasoline/petrol 600 hp engines. Many people have commented on the unusual track design for a Cold War tank. This originated from having to produce plans for a tracked vehicle to remove snow from German operated ports and airfields. 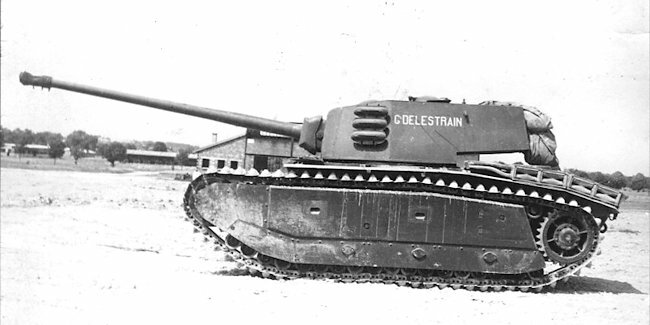 In order not to make the Germans suspect they were designing a tank rather than a snow plow the French engineers worked on producing a new wide track to decrease the surface pressure exerted by the vehicle on soft snow and one that could bite into ice and snow covered terrain. The tracks were very similar to those used on the French heavy tank the Char B1. As such, the vehicles delivered from 1949 to 1951 to the 503e Régiment de Chars de Combat stationed in Mourmelon-le-Grand, replacing 17 former German Panthers. The brakes, gearbox and suspension were proven too frail and had to be changed frequently, resulting in a short lifespan. These were integrated into various re-built armored divisions largely equipped with US-built M4 Sherman, and M24 Chaffee tanks. As such, this was one of the most heavily armored tanks inside NATO, as the 120 mm 45° frontal slope was equivalent to 170. The 90 mm was proven accurate and a good asset against the latest generation Soviet T-54/55s. However, the hull configuration, high profile, obsolete suspensions were radical trade-offs which limited its tactical role alongside faster tanks. By 1953 they were gradually phased out and replaced by the M47 Patton. Out of the 60 ARL-44 tanks that were built five examples survive today: one at the French Tank Museum in Saumur, France; one at the 501/503 Régiment de Chars de Combat, Mourmelon-Le-Grand French Army base in north-eastern France near Reims; there is a wreck at the 2nd Dragoon Regiment base, Fontevraud in France and two wrecks have been rescued and await restoration by the ASPHM Association, La Wantzenau in France. ARL-44 without mudguards, Moumelon-Le-Grand army base, 1951. ARL-44 with a early turret design and 76mm gun. This ARL-44 has the production turret with the 90mm gun. ARL-44 tank preserved at the 501/503 Régiment de Chars de Combat, Mourmelon-Le-Grand French Army base in north-eastern France near Reims (credits wikimedia commons). Can I make a request for an article? Hmmmm. Perhaps the M53/55 or the Object 704/268. I’ve already commented this before, but its worth saying because of this topic. You working on a page for the 90mm Gun Tank T49? Because I have found some pretty legit documents for it, which I feel you guys might’ve found already, but its worth noting just in case you did. Hopefully this should help the development of that page. Im surprised the US actually tried to upgun their Light tank, despite the 90mm gun being designated for their Medium tanks. Best hopes for a great 2018 for TE! And another cold hello from Canada, friends. Though there are no immediate plans to cover the tank, it may well be covered this year. This info is a great help none-the-less, so thank you.